Maintenance-free operation, sealed lead acid wheelchair batteries (SLA batteries). AJC® Battery is the leading provider of wheel chair batteries in the market place today. Our quality line of rechargeable wheelchair batteries are powerful, clean and maintenance free. Buy with confidence that replacement wheelchair batteries from AJC® Battery will have a long, maintenance-free life at a great price. AJC® Battery batteries are manufactured in a variety of sizes and Amp Hour (AH) ratings allowing for maximum flexibility in design and use. AJC® Battery, a world leader in battery technology, manufacturers the highest quality Wheelchair OEM replacement batteries for the widest range of OEM manufacturers in the battery industry. 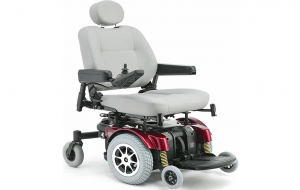 All AJC® Battery Wheelchair batteries utilize the highest quality, absorbed glass mat (AGM Battery) technology for prolonged life and superior performance. AJC® Battery Wheelchair batteries are delivered charged, sealed, maintenance free- ready for customers to install and use. Below is our listing of OEM replacement Wheelchair batteries that we provide. We can also provide customers with other battery technology and products that are not listed below, so please contact us today with any questions.